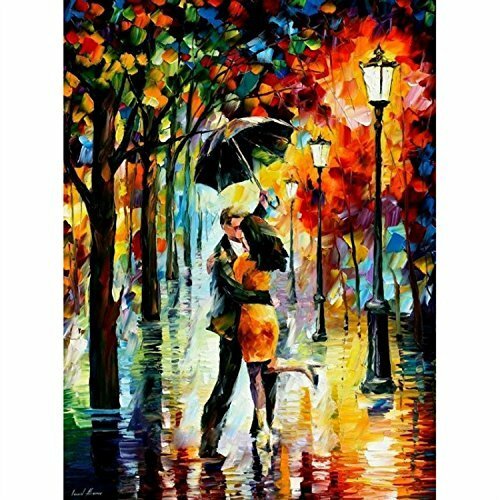 Kisstaker 3D Diamond Sticker Rhinestone Cross Stitch Painting Kit Rain Lovers 32x40cm(12.5x16.5'') by Kisstaker at Designers Artists. MPN: unknown. Hurry! Limited time offer. Offer valid only while supplies last. Product Description: DIY diamond painting is the new popular products. It is beautiful what you see in the picture, very shining and amazing. DIY Diamond Painting Kits Arts : Diamonds sparkling, strong third dimension. Wealth and good fortune diamond painting embroidery cross stitch home decoration. Color: Color printing, environmental canvas, high definition pattern, good texture and aesthetic feeling with rhinestone cross stitch kits. Perfect color match, diamond painting vivid image. Design: Perfect design layout, showing furniture fashion ideas. 5d diamond painting kit. Clear drawing, spend less time to finish, easier than the ordinary embroidery. Diamond Effect: DIY painting with resin sequins is dazzling, shining in the light, currently most popular DIY home decorations. Perfect color match, diamond painting vivid image. DIY Design: You can add more funny to your life, easy to stick. You can provide the pattern you like make the crystal painting. If you have any questions about this product by Kisstaker, contact us by completing and submitting the form below. If you are looking for a specif part number, please include it with your message.